The first time I ever went to Death Valley, it was under protest. 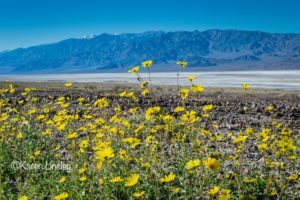 I had gone to a photographer’s convention in Vegas with a fellow photographer who insisted on stopping at Death Valley on the way home. I was not impressed, but he was driving, so I went along for the ride. We get there and I immediately became impressed. Why they call this place Death Valley is beyond me. Well, actually, I know whey they call it that. Something about extreme heat in the summer killing everything that stops long enough to experience it. But go in the spring, or the fall, or the winter months, and it’s different. What I was impressed by was the energy there. Call it woo woo if you want, but I feel energy. It’s a powerful thing, that energy. It’s like The Force, and if you allow yourself to feel it, you can learn awesome things. 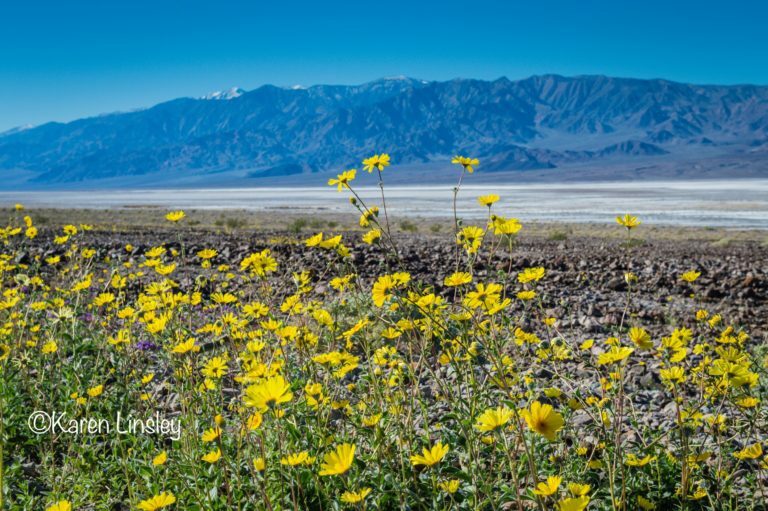 There is a stillness about Death Valley that has much to teach us, if we allow it. I’ve since gone back to Death Valley many times. I’ve gone alone, and I’ve brought groups in. This year, on March 6-8, I’m bringing another group in. I call it the Creativity Retreat. A couple of things: I’m different. Some might say I march to a different drum. Actually, what really happens is that I hear a different beat than most. It’s the beat of that woo woo energy I was speaking of. I believe that if you get quiet long enough, you begin to get in touch with that Force, and you open up to new and wonderful things. This is what creativity is all about. And this is what the camping is all about. I could take a group to a hotel. But then the whole camping/energetic/woo woo experience would change. I like the whole camping/energetic/woo woo experience. You say you don’t camp? Then this is your first lesson. Come. Step outside those limitations and see what happens. This is also a part of creativity. So come. Join me and some other pioneers. Camp with us. Share meals prepared at campside by whoever wants to participate. 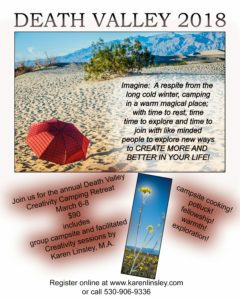 Sit and experience the energy that is Death Valley, do a bit of inner exploration, prompted by me, yours truly. Explore the valley a bit too. There will be time for that. My husband seems to think that money is tight. I did the math. $90 for the retreat itself, maybe $50-$100 for groceries, maybe $100 for travel to get there and back. $300 for a life changing experience. To me, it is a no brainer. But then again, I did say I march to a different beat.